For the first time ever, the meditative, ambient minimalism of the Quiet Music series is available in its entirety in a 3-CD digi-pak release. Originally released in the mid-’80s on cassette and later in a truncated 2-CD edition, Quiet Music (The Original 3-Hour Collection) presents this landmark album as Roach envisioned it. Quiet Music is a collection of pieces created between 1983 and 1986 in respect for silence. The gentle electronics of Roach’s synthesizers mix with flute, electric piano and sounds of nature flowing like breath, enveloping the listener in a sustained, delicate, translucent atmosphere. Much of this music began as a series of early-’80s recordings commissioned by healing-arts programs and later used for everything from personal meditation to birthing music. Today these pieces still stand as a cornerstone in body-work, yoga, and healing therapies. Listening to the release anew, one can sense Roach’s emerging vision of expressing a rarified, tranquil inner experience through sound and music: a vision both emotional and vivid. The soothing, introspective nature of Quiet Music flows at a time-suspending pace, gently evolving and using space to expand and explore the essence of silence. The space between the notes and the breathing quality bring the listener to a deeper awareness of the present moment. Let’s make a long story short. Considered as being the highlight of relaxation, meditation and healing music, Quiet Music was composed between 1983 and 1986. Initially, the Fortuna label distributed it in 3 different shutters on 4 tracks cassette size in 1986. Two years later, a first CD edition saw the light of days. It contained the whole Quiet Music 2 plus a track from Quiet Music 3. In 1999 Fortuna launched a 2 CD-set including remastered versions of Quiet Music 2 and Quiet Music 3 as well as the 1st part of Quiet Music 1. Fortuna’s rights expired and the Projekt label, which produces the music of Steve Roach since 1995 with The Lost Pieces, takes the torch and answers to the more and more insistent request of Steve Roach’s fans by producing the integral of Quiet Music works in a superb digipak box set of 3 CD; Quiet Music: The Original 3-Hour Collection. If the deep tranquillity exists, it comes from the meditation of souls in the sources of the earth. The Green Place is a stunning musical journey that brings us in the heart of the flowering meadows of Colorado high deserts. It’s the very first Quiet Music and a superb CD that had pass beneath my ears and that would be a pity if the same thing would happen to you. Samplings of a nature hypnotized by a majestic calm open “The Green Place Part I”. A river transports delicately its water which pours in delicate waterfalls under the enchanting singings of sedentary birds, captives of this splendid nature which breathes and expires the tranquillity. Soft limpid arpeggios are penetrating there on the tips of their notes and roam among this idle nature that a fine synth line covers of a delicate angelic mist. Dreamer, a soft flute comes to meditate and blows beautiful celestial harmonies which espouse marvellously the lyrical undulations of a synth which lulls all of its euphonies. This pinnacle of serenity follows its road, as a long and soft river of tranquillity, and fall in the notes of a wonderful piano. Notes which cast a veil of melancholy and which are throwing into the shimmers of a synth to loops and to divine rotary movements. We are in the 15th minute and it is pure magic. One is totally subjected by this piano from which minimalist notes spread out with fine modulations in their emotions. Notes which fall with such a delicacy that we go to daydream in this peace of mind environment where the soft nature is mixing in the breaths of an enchanted flute, in the soft embraces of a bewitching synth and in the delicate notes of a melancholic piano. “The Green Place Part II” is in the same spirit of calmness but with a little more musical intro, even more melodious. Arpeggios are less hesitating and form a beautiful oniric ballet with suave synth breezes. It’s a very good melodious intro which flies over the weak debits of waterfalls beneath the veils of a benevolent synth which enters in a temporal spiral to swirl delicately, a bit as Michael Stearns’ on the splendid Chronos. And the piano hatches. With the same notes as on “The Green Place Part I” and the same hoops of a synth to breezes of mist which is winding the entire emotionalism, “The Green Place Part II” emerges of an even more oniric melodious influx. Ending thus a jewel of quiet music! Quiet Music 2 presents 5 tracks to more electronic tendencies than those of Quiet Music 1. “See Things” is a slow immersion in a universe of solitude with synth layers which couple and complain with delicate melodious filets. Short but melodious, “Towards the Blue” moves while following the course of a river flowing of serenity and beneath some fine oscillations of a synth which crosses more melodious and dreamy pads. “Something in Tears” is very striking with its synth layers which float and crisscross with a stunning sensibility. “A Few More Moments” is another jewel of stillness on this splendid box set. Slender synth strata float and roam in a slow soporific whirlwind. They interweave to form an enchanting cerebral ballet that delicate minimalist chords raise towards a night-melody which is not without reminding the superb Reflections in Suspension of Structures from Silence. It’s a delight for the ears and ideal for meditation, quite as the very ambient “Air and Light” (the longest track of Quiet Music trilogy), which is a real morphic monument for the peace of mind. It’s a very long track which evolves as an obsession for quietness where synth layers wind and intermingle in a strange and glittering luminosity to plunge us in the depths of our subconscious and get fresh ideas in the strength of silence. Quiet Music 3 begins with the very beautiful “Dreaming and Sleep” and its synth layers which juxtapose in a beautiful harmony where the fluidity of night spectres shapes strange interior voices which murmur and hum discreet night-melodies. Splendid and intense, these melodies espouse delicious and long movements of serenity which wind with delicate synth implosions to guide us throughout this overnight filled of spiritual magic. It’s a sublimely oniric track, quite as its twin “Sleep and Dreaming” which is accompanied by Will Morris’ suave fluty breaths. Incredibly bewitching, “Quiet Canon” raises proudly the ingenuity of its naming. Wonderful synth arches follow each others in a minimalist echo to shape a great musical canon; Steve Roach’s canon. Its polyphonic waves espouse fanciful violins of which slender bows hits are melting in the astral decoration sets by a solitary synth. These wrapping layers carry this night-lullaby in the temple of our dreams and whims. 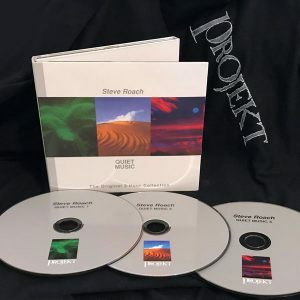 This is another splendid jewel of ambient and meditative music, signed Steve Roach. 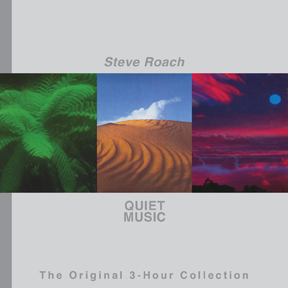 Quiet Music is one of the milestones in Steve Roach’s huge discography as well as in the genre of ambient music. Recorded during the period of years 1983 to 1986 and firstly available on three cassettes, few years later, in 1988 released as CD album and in 1999 collected and remastered to a 2CD edition, all by Fortuna. Now, when Fortuna rights expired and 25 years passed since its creation, finally available via Projekt as Quiet Music: The Original 3-Hour Collection 3CD packaged in very decently and attractively looking 6-panel digipak. 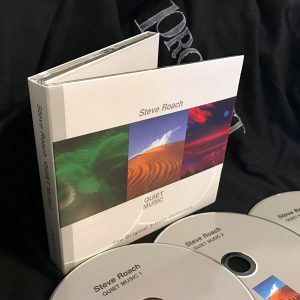 As indicated by its title, Steve presents here absolutely peaceful and minimal aerial washes, floating ambience at its most relaxing and meditative level. Several long form pieces are featured on this treasured set, for example both parts of “The Green Place” that complete disc one, each one clocking over 30-minute mark. This is most likely the most naturally sounding ambience in these series with strong organic feel enriched by captivating and relaxing field recordings that beautifully color Steve’s serene soundscapes and Will Morris’ flute (with the synthesizer help of Mike Christopher at the beginning of Part One). The music splendidly portrays the first part of the cover image. Ambient music has been around now for a long, long time. Once championed by Tangerine Dream, a successful German ambient band from the ‘70s, the genre has consistently expanded to become many things for many people. From therapeutic, musically backed waterfalls and ocean splashes to the magnificent textures of Michael Hoenig (Departures From The Northern Wastelands – 1977), to the many-faceted soundscapes of Steve Roach, and the distorted guitar ambience of Dirk Serries, ambient music is a powerful force in music. On October 11, Projekt Records will release Quiet Music: The Original 3-Hour Collection in a three-CD set that collects all three of the original single album recordings. Released between 1983 and 1986, each volume was designed to add ambient beauty in low tones to the quiet that already surrounded you. Using synthesizers as a soothing flow of music, and mixing in nature sounds and traditional instruments like flute and electric piano, Quiet Music was something that provided many things to the listener. The latest reissues of Steve Roach give an opportunity to see the evolution of one of his styles, that of the long-form ambient drift. The Quiet Music series was comprised of three, roughly 60-minute cassettes when they were first released. A CD was also reissued of the Quiet Music 2 cassette in 1988. This new version is an expansion of the Quiet Music 2 reissue with a second disc added on that, unfortunately, does not complete the reissue of the entire cassette set. Half of the two-part suite from Quiet Music 1 called “The Green Place” is missing, and the full version of “Dreaming and Sleep” is still replaced by an edit. The “Complete” in the title implies that these missing elements are not currently being considered for reissue. For all the music in the series, silence is the basis of the music, making it difficult to review in detail. These are perhaps Roach’s most Eno-like works and reflect a much more melodic and, dare I say it, pretty music, than the more abstract and frontier-treading sounds he creates today. All of the music rests on pillowy clouds, chords floating up muted and angelic, but all within earshot of the void of silence, a theme that Roach would return to again and again. As the song titles suggest, such as “Sleep and Dreaming,” this is ideal music to back up the late hours, sounds that you may not notice ephemerally at a low volume sink into your subconscious memory and dreaming. My first exposure to the music of Steve Roach was buying Western Spaces, based on an article in I/E magazine. Since then, I have been enamoured of his particular brand (so to speak) of electronic/ambient/fourth world music. Besides its obvious relaxing qualities – much of this type of music is relaxing – there is also something ethereal and earthy about most of his work, especially that of late where he is experimenting with Native American/southwestern rhythms. Quiet Music is really no exception. The blurb on the back cover reads “Like a shimmering mirage on the desert, this subtle music reflects your own images, evoking shades of mood and meaning.” I really couldn’t put it better myself. There are tracks here are so subtle that on the one hand they almost stand still – like one moment is captured, and yet convey a sense of movement. Of, well, drifting sands and floating clouds. It is at once relaxing and intriguing, wondering where the next note leads – the next dune leads, perhaps. I would imagine that for anyone who spends a great deal of their time in the city, this music may not mean much to them. Except for the wee hours of the morning, and maybe not even then, there isn’t much complete silence to explore. For those who spend time in the “great wide open,” this will resonate with them. This album evokes the sound, mood, and feel of silence. One person alone with elements, at one with the universe, so to speak. And while that sounds like “New Age mumbo-jumbo,” it really isn’t intended to be. We should, however, spend more time reflecting upon ourselves, discovering who we are, what makes us the unique individual we are. When you do that, you can appreciate more the things around you.